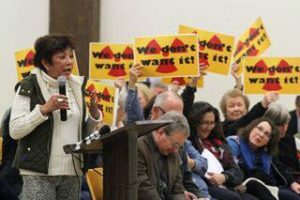 Radioactive waste storage proposals have gained renewed vigor under the Trump administration but are facing an uphill battle. Congress is attempting to revive the Yucca Mountain waste repository in Nevada for up to 110,000 tons of waste reactor fuel, and to proceed with lesser-known “Centralized Interim Storage” (CIS) proposals. Two private CIS sites are currently seeking licenses from the Nuclear Regulatory Commission, even prior to Congressional approval: Holtec International/Eddy-Lea Energy Alliance’s facility in New Mexico, for 173,600 metric tons; and Waste Control Specialists’ (now known as Interim Storage Partners) expansion of their Texas facility to allow storage of 40,000 metric tons. The type of dump that Holtec is proposing, (referred to as an Independent Spent Fuel Storage Installation) is currently illegal in the US. Nevertheless, the Nuclear Regulatory Commission (NRC) is allowing Holtec’s licensing process to move ahead. In April a public comment period opened regarding the scope of the Environmental Impact Statement. It met fierce opposition from the low income and people of color being targeted for the “parking lot dumps” as well as a large nationwide coalition. Hundreds of participants gathered at public scoping meetings to oppose Holtec. During a short comment period, the efforts to raise public awareness were far-reaching. 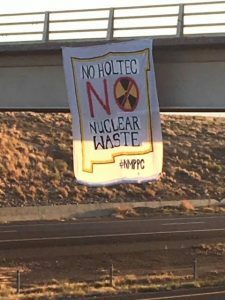 Twenty-one members of the New Mexico House of Representatives and nine state senators sent letters to the NRC opposing the Holtec dump. The two largest cities in New Mexico, Albuquerque and Las Cruces, both passed resolutions opposing the dump, along with Bernalillo County and the cities of Lake Arthur and Jal. Additionally, the New Mexico Cattle Growers’ Association passed a resolution opposing the dump after not being consulted or considered by Holtec. Gubernatorial candidate Michelle Lujan Grisham has expressed opposition to the dump. In all, 25,000 comments against the dump were submitted to the NRC. A draft Environmental Impact Statement is expected in the summer of 2019. The application for the other CIS proposal, the expansion of the Interim Storage Partners facility 40 miles from the Holtec site in Texas, was accepted by the NRC on August 27. Dallas, Bexar and Midland Counties passed resolutions opposing the dumps and radioactive waste transport.